How to resolve the toolbox configuration issue in Visual Studio 2017 update 15.4.X for Syncfusion versions 15.3.0.33 and earlier? While installing Syncfusion Essential Studio setup, Syncfusion controls will not be configured by default in the latest update of Visual Studio 2017 (v15.4.x). We have already fixed this issue in the ToolboxInstaller utility and the fix has been included in our Syncfusion 2017 Volume 4 release v15.4.0.17. For the Syncfusion Essential Studio v15.3.0.33 and earlier, follow the below steps to configure the Syncfusion controls to Visual Studio 2017 toolbox. 1. Open the Visual Studio 2017 and go to Tools->Extensions and Updates. 2. 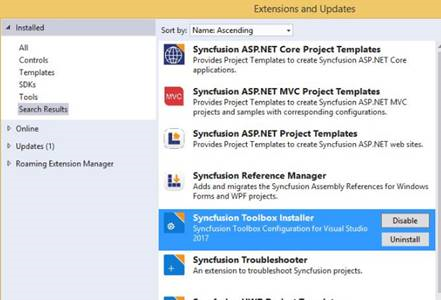 Uninstall the Syncfusion ToolBox Installer extension and close the Visual Studio. 3. Download and extract the patch for the required version below. 4. Take a backup of ToolBoxInstallers folder from the below location. 5. Copy and replace the ToolBoxInstallers folder from the extracted zip file to the above location. 6. Follow the steps suggested in the following KB article link and configure the Syncfusion controls in Visual Studio toolbox. 7. Open the Visual Studio 2017, disable Syncfusion ToolBox Installer extension and close the Visual Studio. 8. Open the Visual Studio 2017, enable the Syncfusion ToolBox Installer extension and restart the Visual Studio 2017. Now, Syncfusion controls will be configured in Visual Studio 2017 toolbox. Note: For the previous version of Visual Studio 2017 (before VS 2017 update v15.4.x), it is not necessary to perform these steps as the Syncfusion controls will be loaded automatically.